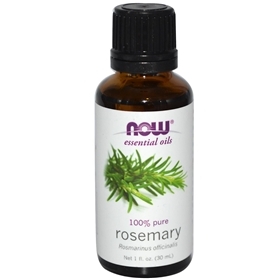 NOW Rosemary Oil - 1 oz. In addition to its mild camphoraceous, uplifting aroma, the natural compounds in Rosemary oil contain strong cleansing properties, making it ideal for anyone concerned with immune system health, NOW Rosemary Oil is steam-distilled. In addition to its many physical properties, rosemary is also said to have an affect on the memory, opening the conscious mind, and assisting in learning. Emotionally and spiritually, these affects spell the potential for mental expansion, clarity, and insight, something that can be especially useful during transition and change.